You hear it all the time. “Everything happens for a reason.” Bill Moore, owner of PacMoore believes that is true, but for him, it is not coincidence, it is part of a journey that God wants him to be on. Not just the path, but the people who join him on the path are included in that journey. It actually began before he ever realized where it would lead him. PacMoore is a food manufacturing and processing company, that makes products according to contract specifications for some of the largest food suppliers in the nation. The family business evolved as do so many small businesses. Moore’s step-father, George Meyer, played a big role in his life growing up and an even more significant role after he died suddenly in the late 1980s. George Meyer had owned a series of businesses and properties, the last of which was a steel plant converted to a warehouse in Hammond, Indiana. The company that is now known as Cargill was his primary customer and they stored food-grade ingredients in the warehouse. When the company moved their operation, George found he had no customers, but was left with millions of pounds of ingredients, which he was able to buy for cents on the dollar. He began sourcing customers for the ingredients. He was building that revenue stream when the bank holding the note on the warehouse went bankrupt. His note was called and not having capital readily available, he was forced into bankruptcy. Then the worst happened. George died suddenly. The bereft widow had no idea the state of George’s business and when she discovered where it stood, she knew she needed help. She called her son, Bill, explained the situation and asked for help. When Moore got that call it was early in his building of a highly successful career as a chemical engineer designing Pampers for Proctor & Gamble. He said his thought was, “Oh, man, this is not what I had on my mind.” He discussed the situation with his wife of just four months, Susie, and they decided the right thing to do was to help his mother. Download the full November 2015 Edition here. 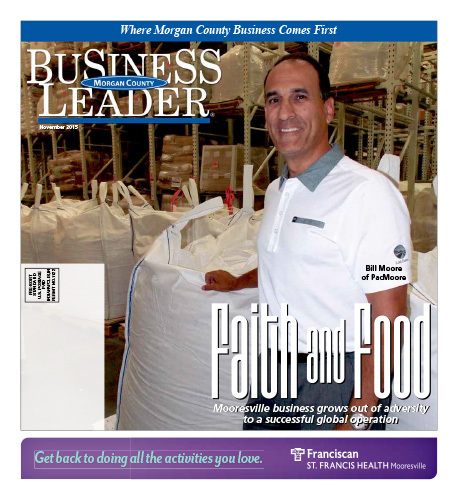 Celebrating Morgan County Business | ©2019 Morgan County Business Leader | Developed by NuMedia Marketing, Inc.